Hippeastrum Stargazer is a tall Amaryliss variety. Approx. 70cm and wholesaled in Batches of 30 stems. 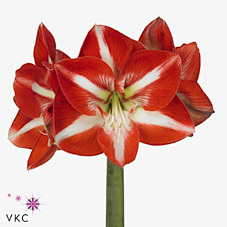 Hippeastrum Stargazer is mainly thought of as a Christmas flower but is available for many months. Hippeastrum, (otherwise commonly known as Amaryllis), is a genus of the Amaryllidaceae family and is native to South American regions such as Mexico, Argentina and the Caribbean.